As Catholic Christians, we are called to be disciples of Jesus. This requires each of us to discern, accept and live out our commitments, responsibilities and roles to which God has called us. We recognize God as the origin of life, giver of freedom and source of all things. We also look to the life of Jesus for guidance in living as Christian Stewards. This means that we receive God’s gifts gratefully, cultivate them responsibly, share them lovingly with others and return them with increase to the Lord in the form of Time, Talent and Treasure, dedicated to the well-being of others. In this way, we can truly thank God for His blessings. What does Time, Talent and Treasure mean? Talent: All of our knowledge and abilities are gifts from God. St. Paul reminds us that there are many parts of our human body and that each part functions to support the whole body. In his words: “Now you are Christ’s body and individual parts of it. Some people God has designated in the Church to be first, apostles; second, prophets; third, teachers; then, mighty deeds; then, gifts of healing, assistance, administration; then varieties of tongues. Are all apostles? Are all prophets? Are all teachers? Do all work mighty deeds?” (1 Corinthians 12:27-31) God created each of us as individuals, so our talents are different and we compliment each other. It is in working together, contributing our individual special talents, that the Body of Christ flourishes. Treasure: All that we are and all that we have comes from God. We apply the knowledge and ability God gives us to provide for our families, to share with others and to save for future needs. About sharing treasure, Paul wrote, “Consider this: Whoever sows sparingly will also reap sparingly, and whoever sows bountifully will reap bountifully. Each must do as already determined, without sadness or compulsion, for God loves a cheerful giver.” (2 Corinthians 9:6-7) Each year we remind parishioners of the many gifts with which God has blessed them, and we ask our disciple stewards to commit some of their resources to maintain our facilities, support our parish ministries, support missionaries and provide means to reach out to needy neighbors in community. How can I give my Time? Resurrection offers so many ways to give your time to God. Participate actively in a ministry. Volunteer to help with children at Mass, as a teacher at LiFFe Nights, or in the gift shop. Help out at Talbot House serving food, volunteer at Mardi Gras festival or at Paint Your Heart Out Lakeland painting the home of a neighbor in need. 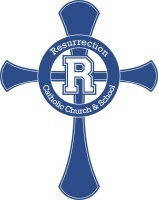 Pray for Resurrection, its parishioners and ministries. How can I give my Talents? What gift has God given you that you want to share? Musicians and singers will find a home in the Music Ministry. A gift for public speaking? Become a lector. Those who love to serve can join a Pastoral Care ministry, such as Helping Hands of Martha, Giving Tree or can become Extraordinary Ministers of Holy Communion. Those who enjoy working with children have so many opportunities to guide their spiritual and physical growth. If you have a talent the Lord is calling you to share, call the front office at 646-3556 and ask how you can help. How can I give my Treasure? Every week at Mass is an opportunity to give of your treasure. Weekly collections defray the cost of operating the Church. Special collections are also taken for Resurrection Catholic School and Santa Fe High School, missions, Peter’s Pence, Talbot House and many more. By receiving envelopes, you will see which special collections are coming in the next month. Online giving is an easy way to give your treasure each week. There are many more ways to give your treasure. Donate to Food Pantry or Giving Tree. Give to LiFFe Night fundraisers like the 5K run or the Poker Tournament. Pledge to Our Catholic Appeal every year and join Alive in Christ to help bring us closer to our goal of building a ministry center. If you feel called to give your treasure, call the church office at 646-3556 and ask how you can help! Why do we use envelopes? It is very important that parishioners use the envelopes provided. They are the basis for the recordkeeping necessary for income tax purposes. They serve an additional function as a record of Mass attendance. No matter how much you choose to donate, using your envelope regularly is the best way to demonstrate you are a practicing Catholic. If you routinely put cash in the offertory basket, it is difficlut for the church office to verify that you are an active member of the parish. Yes! Go to Parish Giving, our online giving resourse, enter our parish name, and sign up to have your weekly stewardship donations taken directly from your bank account once a month. What opportunities are there for children? Stewardship begins in the home. We use the weekly Children’s Stewardship Envelopes as a means of teaching our children the importance of giving of self as they record their gifts of time and talent in their family, at school and in the Parish and Community activities. They may include a treasure offering in their envelope, if they wish. We are a vital part of the Diocese of Orlando, the Central Florida Catholic Community. Our Bishop and his staff provide support in the form of leadership, services and training for ministry efforts carried out in our parish. As Stewards, we participate in OCA to provide funds for these Diocesan activities and for charitable outreach to our Sister Diocese, mission activities, and other ministries worldwide.